Lizards are on the loose in South Florida and FIU biologist James Stroud needs local middle schoolers to help him keep track of the reptiles. Stroud is training middle school students to collect information on anole lizards, including species, size and where they are found. To help the young ecologists, he has created a Field Identification Guide for the Anole Lizards of Miami and an established protocol for how to collect project data. The information gathered will contribute to Stroud’s doctoral research, which is focused on understanding how different species of anole lizards coexist in South Florida. 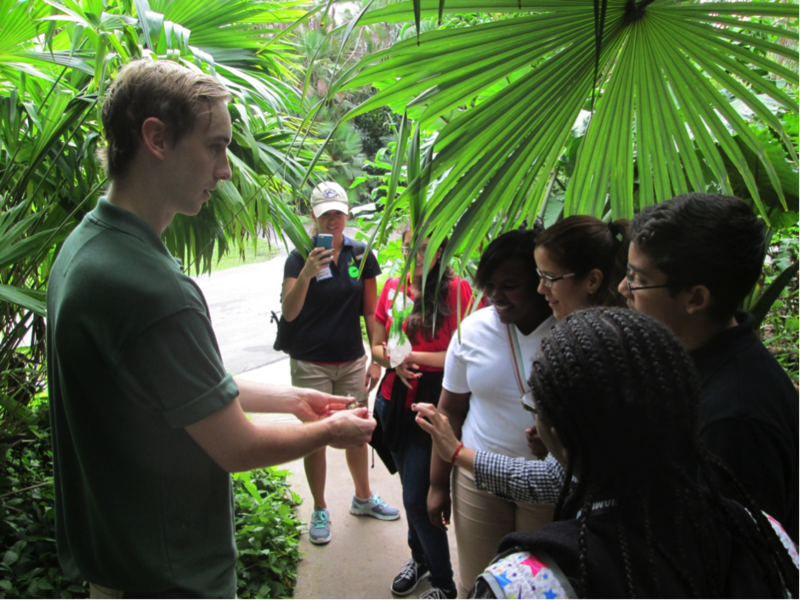 FIU biologist James Stroud (left) is training middle school students to collect information on anole lizards. “I love being like a science detective and figuring out what kind of anole they were and where they came from,” said Nicole Markus, a student at Palmetto Middle School. Known as the Lizards on the Loose Challenge, Stroud developed this outreach program with researchers from the Fairchild Tropical Botanic Garden and University of Rhode Island. It is part of The Fairchild Challenge, a nationally recognized, K-12 environmental education program. Now in its fourth year, Lizards on the Loose has resulted in more than 1,500 lizard surveys being conducted by more than 1,000 students from public and private schools throughout Miami-Dade, Broward and Monroe counties. Students analyze and present their results in a video as part of the challenge. Terri Ortiz, a sixth grade science teacher at Palmetto Middle School, has participated in the challenge every year since its inception. It provides new opportunities to engage her students in science beyond the classroom walls. For some middle schoolers, it’s the first time they are being exposed to South Florida’s rich and diverse population of reptiles. South Florida is home to a variety of anole lizards, an abundant and charismatic type of lizard. There is only one native anole species found in Florida, the American anole or green anole, while all others come from the Caribbean. This means many lizards are meeting each other here for the very first time. According to Stroud, novel situations like these are rare in nature, and the large diversity of non-native species provides a unique opportunity to understand how communities form and how they live together. Looking to the future, Stroud hopes to expand Lizards on the Loose into a citizen science program in which students and families will be trained to record observation-based surveys of lizards.